At Albuquerque Copier we know how hard it can be to find the right copier for your business. There are a lot of different brands and copier leasing companies who want to take advantage of you. We believe in fair copier sales at Albuquerque Copier and we sell only the best products. We are proud to sell a wide variety of Ricoh copiers that are perfect for a number of businesses. Our Ricoh copiers are the best around and we carry a wide selection. We are proud to be carrying the highest quality Ricoh products, alongside our vast knowledge of matching businesses with the right copier. Ricoh has become a trusted name in the world of high quality office supplies. 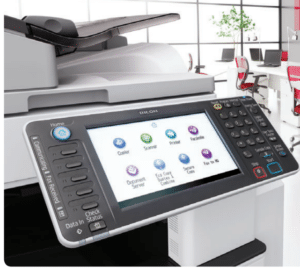 Ricoh’s copiers come with all the functions you’ve come to depend on for your growing business. Whether you need a high capacity, powerful copier that can handle large color prints, or simply a reliable and affordable black and white—we have the right option for you. Call Albuquerque Copier today for a fair deal on the best Ricoh copiers. Our copier leases are fair and we put your needs first. Call today to see what separates us from the other guys.